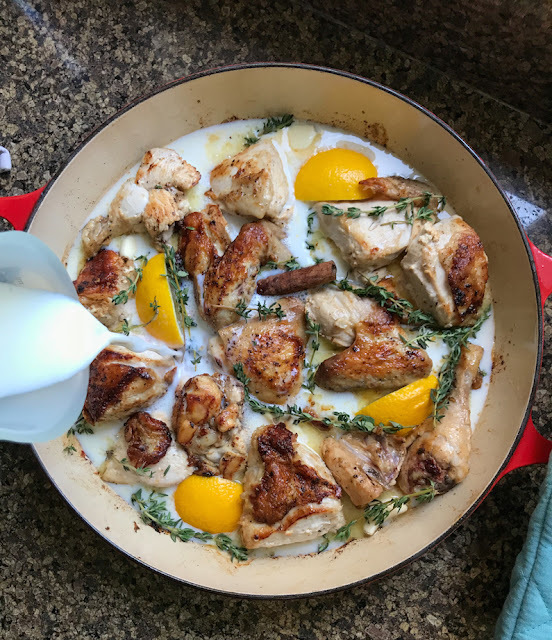 As Jamie Oliver says, this lemon garlic milk sauce chicken recipe sounds like an odd combination but it’s actually incredibly delicious. 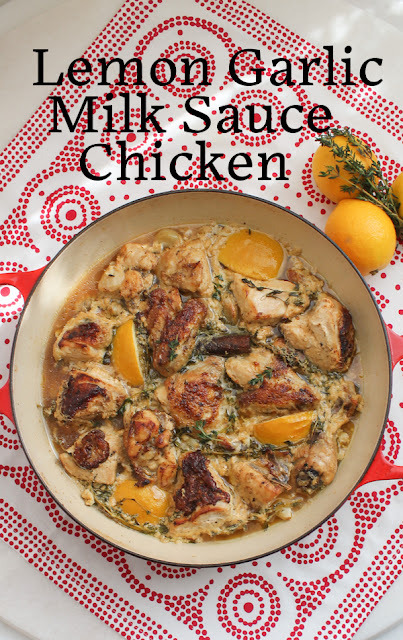 The chicken is golden and delectable but the star is the garlicky milk sauce. 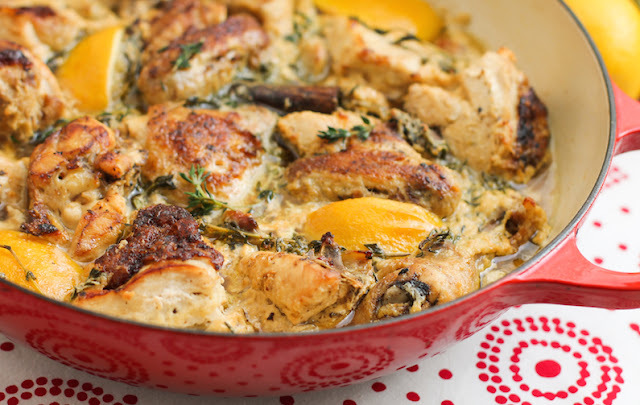 You are going to want to sip that with a spoon straight from the pan. This month my Baking Blogger friends are warding off vampires with strong garlic recipes. This is one of our favorites. You might also want to try my Slow Roast Lamb with 40 Cloves of Garlic, Garlicky Lobster Crab Scampi or my Garlic Chili Tiger Prawns. 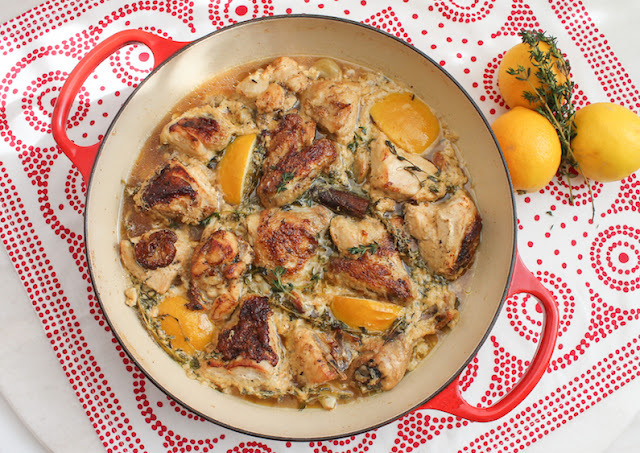 This recipe is adapted from a Jamie Oliver creation I saw years and years ago on his series called Oliver’s Twist. The episode was Big Grub for Big Boys. 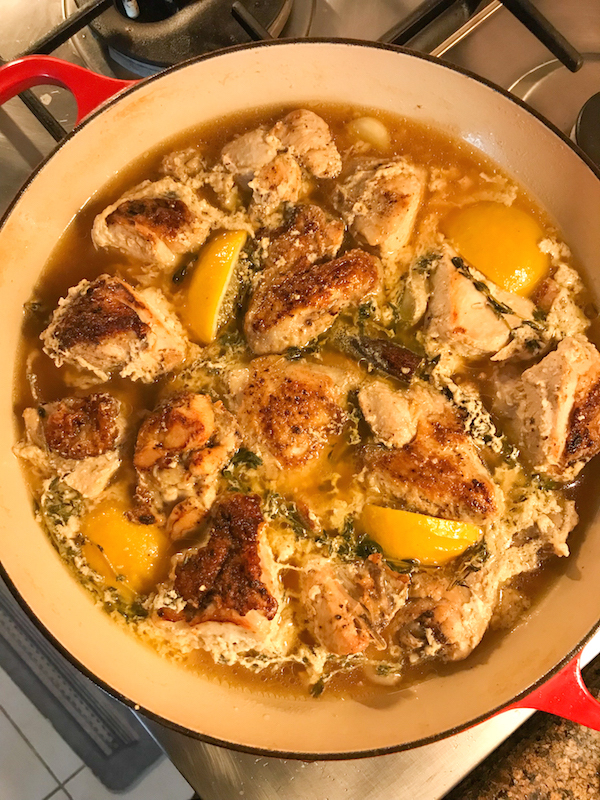 But the first time I ever made Jamie's lemon garlic milk chicken, it was from his book, Happy Days with the Naked Chef and the chicken was cooked whole! It was called, quite simply, Chicken in Milk. Either way, still delicious. Preheat the oven to 375°F or 190°C. 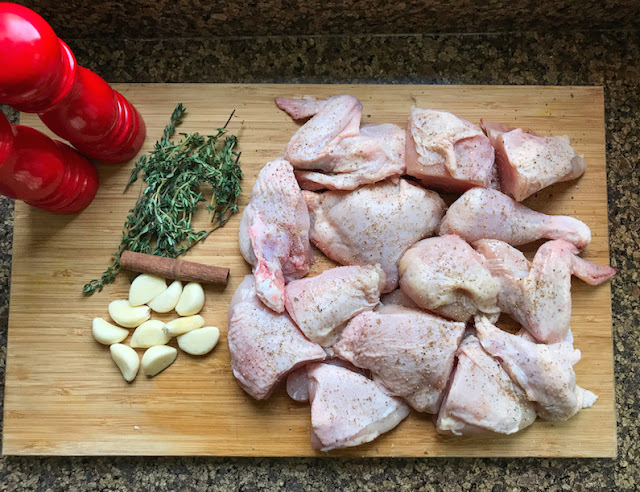 Season your chicken pieces liberally with salt and freshly ground black pepper. 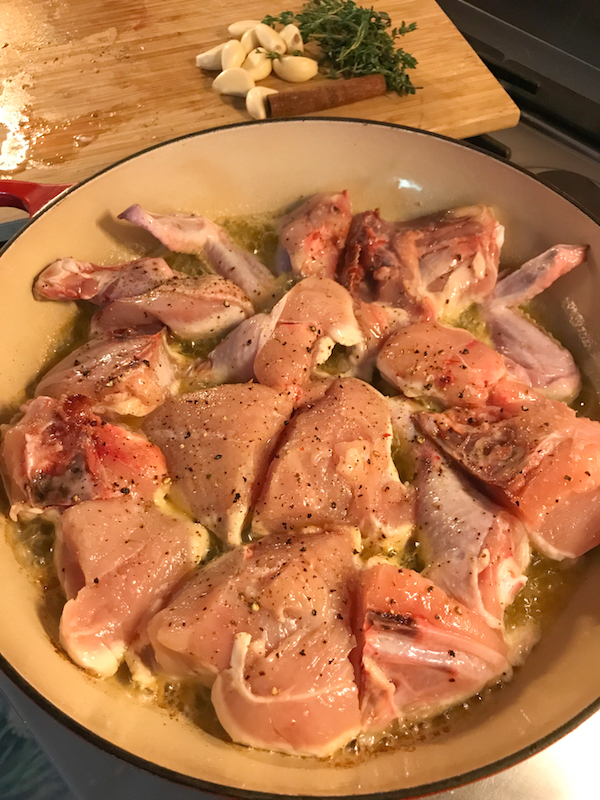 Melt the butter in your pan (choose one with a tight-fitting lid that can go from stovetop to oven) and fry the seasoned chicken in the butter. Skin side down first. 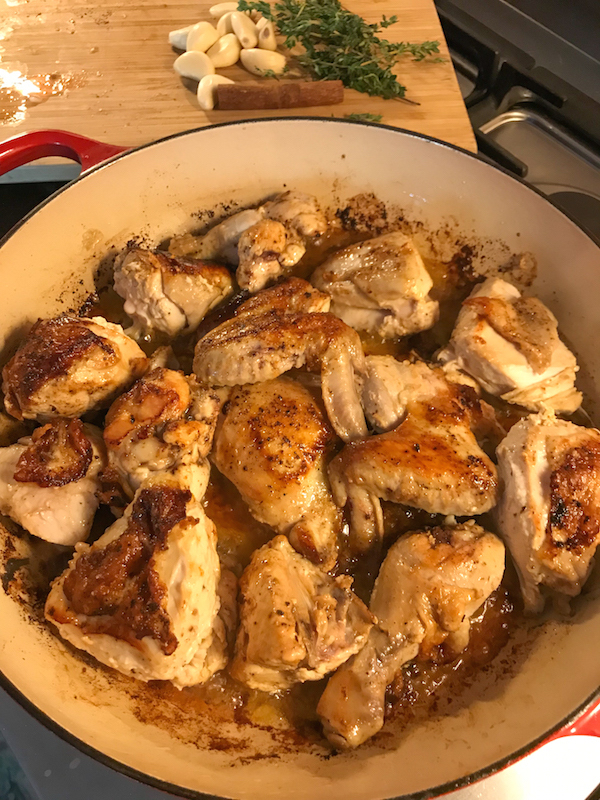 If you need to do it in batches not to crowd the pan, remove the chicken pieces after they brown on both sides. Add in the garlic, lemon quarters, cinnamon stick and thyme. Pour in the milk. Bake in the preheated oven, covered, for about 45 minutes. Baste with the cooking juices halfway through. Remove the lid and cook for a final 15 minutes to brown the chicken a little bit more and to concentrate the sauce. Jamie suggests pulling the chicken off the bones to serve but that seems like a lot more trouble than its worth. Just serve the chicken in pieces with spoonfuls of sauce, some thyme and lemon! Divine. Many thanks to this month’s host, Sue of Palatable Pastime for the fabulous theme! Check out all the other garlicky recipes we have for you! Vampires, beware! Baking Bloggers is a friendly group of food bloggers who vote on a shared theme and then post recipes to fit that theme one the second Monday of each month. 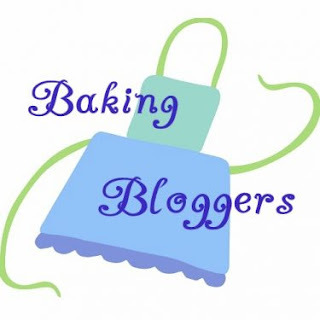 If you are a food blogger interesting in joining in, inquire at our Baking Bloggers Facebook group. We'd be honored if you would join us in our baking adventures.